Enter the New! 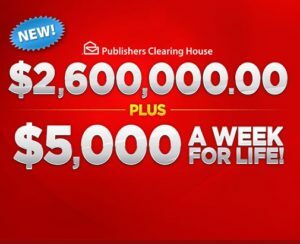 PCH Giveaway $2.6 million plus $5k a week Sweepstakes! 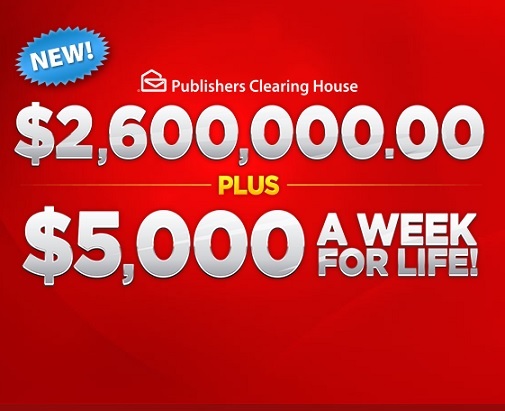 Calling all PCH fans, a brand new Publishers Clearing House Giveaway is here! In true PCH style it is of course both epic and life changing. 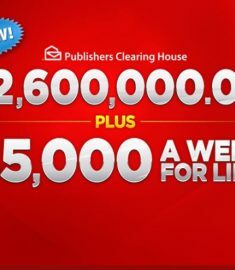 You could be a millionaire instantly and life the life style of the rich a famous. Quick vacations to St Barths, multiple homes, fast cars… The world will open up to you in a million $$ ways! Nothing talks like money and life sure is hard without it. PCH always has the best giveaways and I spend many a night laying in bed dreaming about the day they knock on my door. I hope they don’t bring cameras though, because I truly don’t even have time to do my hair and get dressed properly in the morning, with crazy little destroying the house and climbing all over me. I can see a housekeepers and nanny in my future, I must enter more PCH giveaways, because who doesn’t want to win free money? I don’t want to equate money to happiness, but having financial security can really allow you to pursue dreams and live life the ways you always planned. The ability to buy the odd Chanel handbag is a nice perk too, but travelling the world is my big dream!